Just like in MN/WI, the weather here can have mood swings. On Thursday, it was almost 90 and on Friday, it was barely able to make it into the 60s with gray skies and rain. The latter is my favorite weather and I happily dug out my sweaters, sipped tea, and watched Obama's speech about the Nobel Peace Prize (yay!). A package of Snickerdoodles arrived (part of Austin's fall treat exchange) and I made pumpkin bread. 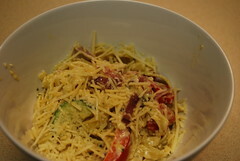 For dinner, we tried to recreate the Cajun pasta we had for our wedding dinner and got very good results. 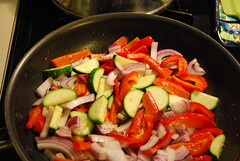 First, we sauteed veggies in butter. Then we took a pint of cream and brought it to nearly boiling, turning the heat down adding some basil, parsley, shallots, salt, black pepper, red pepper flakes, and cayenne. We stirred in about a half cup of a mozzarella-parmesan cheese mix then threw in the veggies and served it over fettuccine. I, of course, had to put even more Parmesan on top of mine. 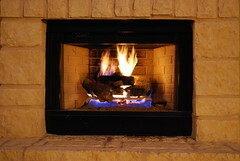 After dinner, we had our first fire of the season and it was perfect.